Mostafa, M., Abd El-Glil, A. (2008). Radiographic and Ultrasonographic Findings of Some Fetlock Disorders in Donkeys. Iranian Journal of Veterinary Surgery, 03(4), 49-56. Mohamed B. Mostafa; Ahamed I. Abd El-Glil. "Radiographic and Ultrasonographic Findings of Some Fetlock Disorders in Donkeys". 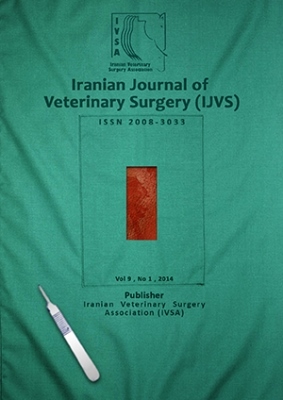 Iranian Journal of Veterinary Surgery, 03, 4, 2008, 49-56. Mostafa, M., Abd El-Glil, A. (2008). 'Radiographic and Ultrasonographic Findings of Some Fetlock Disorders in Donkeys', Iranian Journal of Veterinary Surgery, 03(4), pp. 49-56. Mostafa, M., Abd El-Glil, A. Radiographic and Ultrasonographic Findings of Some Fetlock Disorders in Donkeys. Iranian Journal of Veterinary Surgery, 2008; 03(4): 49-56. Department of Veterinary Surgery, Anaesthesiology and Radiology, Faculty of Veterinary Medicine, Cairo University, Giza, Egypt. Objective- To describe the radiographic and ultrasonographic changes in the fetlock disorders indonkeys. Design- Descriptive study. Animals- - Twenty nine donkeys with clinical, radiographic and ultrasonographic evidences of fetlock disorders and lameness were used in this study. Procedures- Clinical, radiographic and ultrasonographic studies for donkeys have fetlock disorders and lameness were evaluated. Five radiographic views were performed and evaluated. Transverse and longitudinal scans of the palmar/planter fetlock region were obtained. The radiographic and ultrasonographic findings were studied and correlated with clinical signs. Results- All donkeys had marked painful fetlock swelling and lameness. Radiography showed chronic tendonitis with soft tissue calcification. Sesamoiditis with osteophytes formation and osteolysis were detected.. Transverse mid body and lateral abaxial fractures of the proximal sesamoid bones were diagnosed. Thickening and adhesions with increased in echogenicity of the digital flexor tendons were observed. Desmitis of both lateral and medial branches of the suspensory ligaments with thickening, fibrosis were seen. Mechanical trauma, over work long hours in harsh condition, over strain, neglected hoof care and management might be attributed to hard and soft tissue changes and fetlock disorders in the donkeys. Conclusion and Clinical Relevance- Radiography and ultrasonography evaluation of fetlock lameness in donkeys provides a useful aid in delectating the pathological changes in hard and soft fetlock tissues in donkeys.